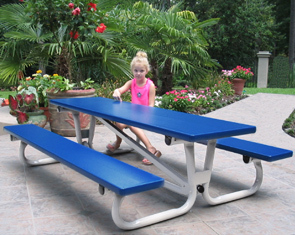 This Quick Folding Aluminum picnic table is designed specifically for children. The folding mechanism has a double push button lock which can be securely locked in the upright position. Structural components are high strength aluminum alloy 6063-T6 extrusions. All tops are .080" thick with integral stiffener ribs. The main frame aluminum tubing is 1.9" outside diameter .109" thick wall pipe and diagonal braces are 1.5" surface with .080" - .090" nominal walls. Fasteners are zinc-plated steel. Tables have 10" wide aluminum serrated-surface bench seating. All surfaces are weather and wear resistant and are finished in powder-coat paint.